Today is the first day of Spring! As the sun shone this morning I listened to birds chirping in the garden. While people are outside in the sunshine mowing their lawns I was inspired to create a cupcake that celebrates the passing of Winter. 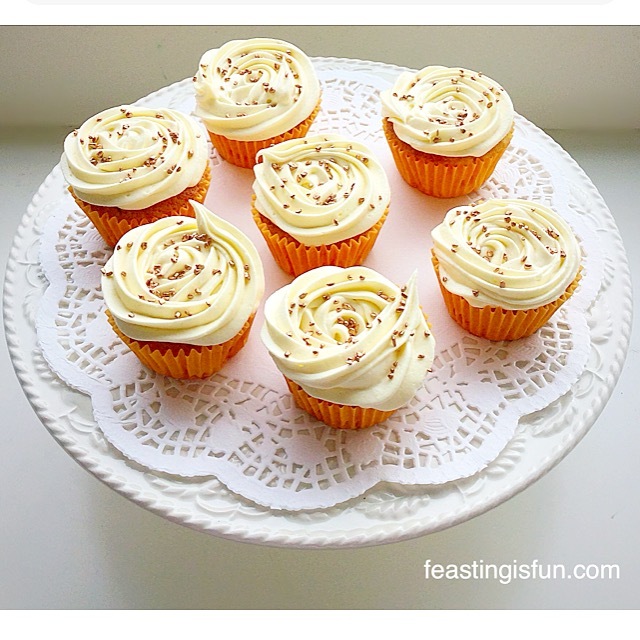 So here are my gluten free Marshmallow Frosted Mango Cupcakes. Sarah at Heavenly Marshmallows sent me a selection of her homemade, artisan marshmallows. Since the selection included nine mango and passionfruit flavour I decided to use them in a recipe. Because the mango and passionfruit marshmallows are gluten free I decided to make a gluten free cupcake, with mango in the cake batter. 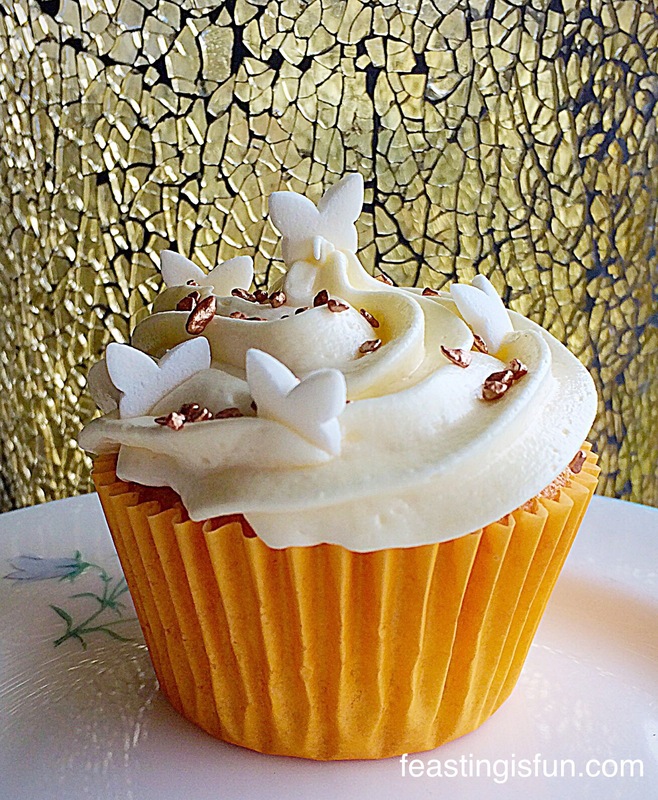 While making gluten free cupcakes was first for me, I also wanted to incorporate the delicious mango and passionfruit marshmallows into the frosting. Since I had seen lots of different marshmallow frosting’s on Pinterest and after reading through a few different recipes, as usual I decided to come up with something of my own. So for these Marshmallow Frosted Mango Cupcakes I decided to make two cake batters. The first batch are gluten free and can be seen in the photos on the yellow background. 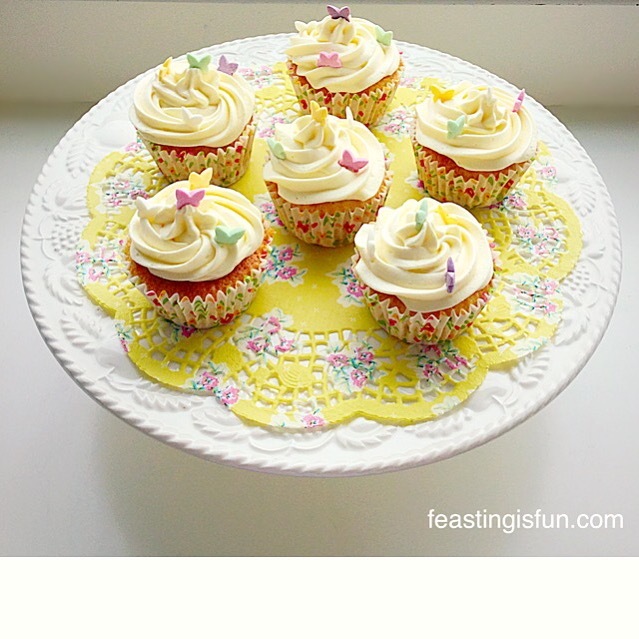 Also the cupcake wrappers are yellow floral, perfect for Spring. While the second batch are in the orange wrappers and are made using plain flour, that is NOT gluten free. Since no one in our home is gluten intolerant, my wonderful family were to serve as ‘taste testers’, in a blind taste testing. Each batch of cake batter had some mango added to it. Because I didn’t have any fresh mango, I used mango from a pot in juice. I mashed up the mango with a fork and added it to the cake batter. 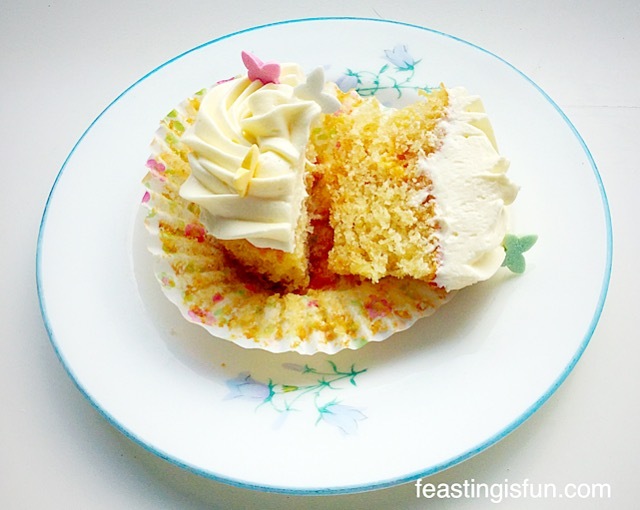 Finally I was thrilled that in both bakes, the mango stayed evenly distributed throughout the cooked cupcake. 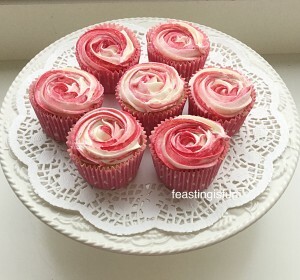 And that was the cupcakes made. I had successfully made gluten free cupcakes, with a good texture. Finally onto the frosting, which wasn’t as daunting as I’d imagined. Although the hardest part was saying goodbye to each of the 9 mango and passionfruit marshmallows as I put them in a heatproof bowl, over a double boiler. Effectively this dreamy marshmallow frosting is buttercream, with melted marshmallows added to it. While there’s a bit more to making it than that, it is no more difficult than making a chocolate ganache, that is then whipped and piped. Instead of the sticky, sweet, frosting that I’d imagined, the opposite was true. Resulting in marshmallow frosting that is the stuff of dreams, where fairies and unicorns live and rain falls like glittery sprinkles. Just took myself off into my dream world there 😉. It truly is amazing. 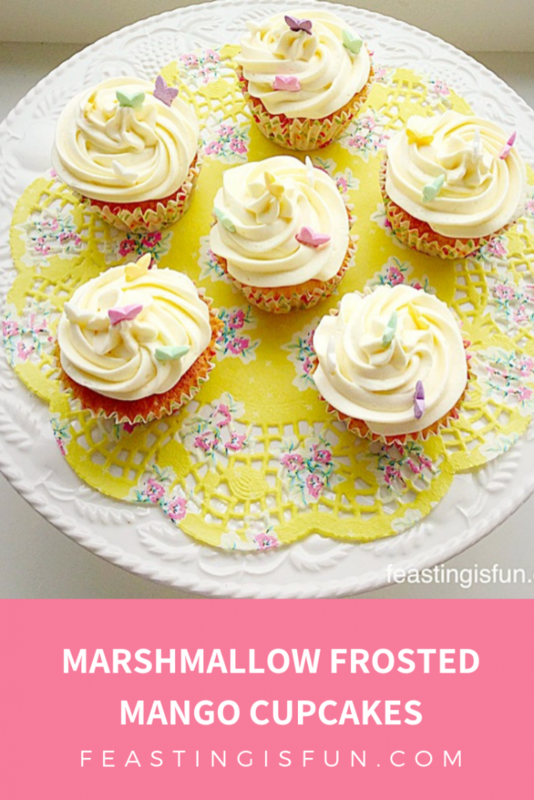 Since the melted marshmallows lighten the buttercream frosting, giving it a mallow, sponginess, that doesn’t set hard and melts, almost like sherbet on your tongue. 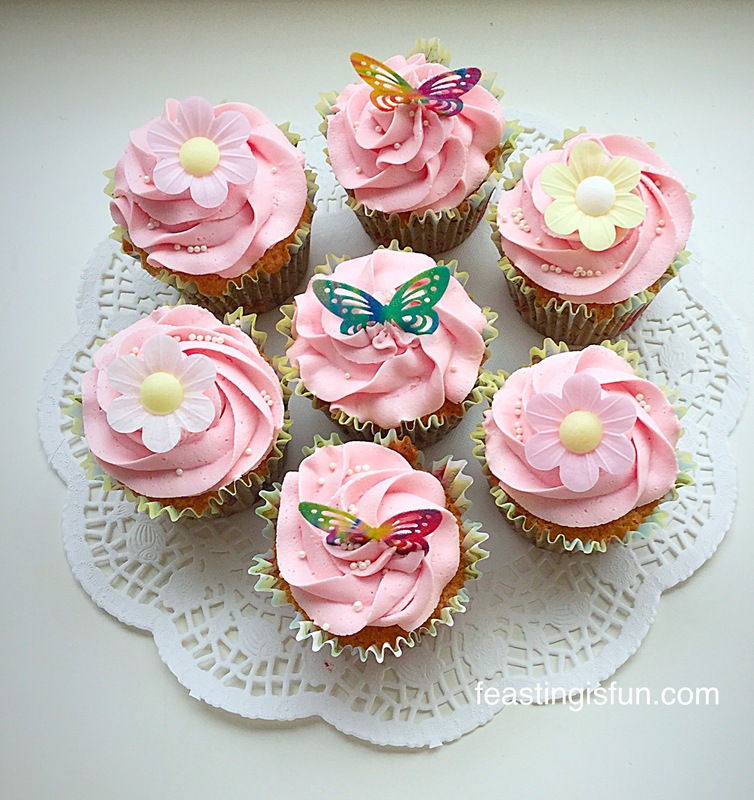 Note: These cupcakes can be made NOT gluten free, just substitute plain white, wheat flour for the gluten free flour. Method and cooking times are exactly the same. 1tsp Baking Powder – Waitrose Cooks’ Homebaking baking powder as it is gluten free – check yours not all brands are gluten free. 75g/3oz Fresh or Tinned Mango – any juice strained off and mango mashed with a fork. 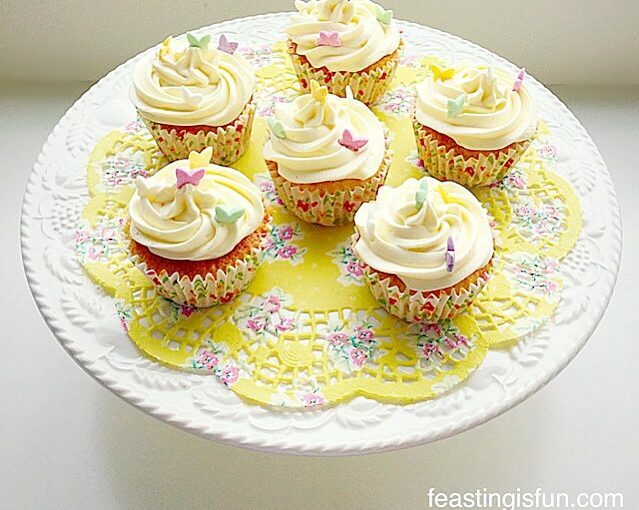 First of all, place 12 cupcake cases in a cupcake or muffin tin. 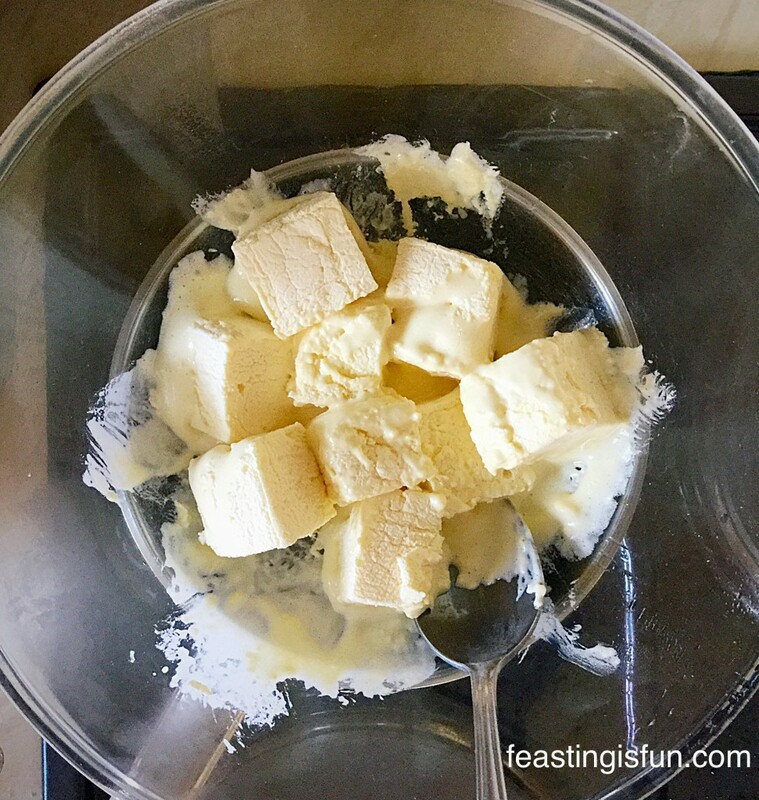 Add the caster sugar,vanilla and butter into a medium sized bowl and whisk/beat together until pale and creamy. Sift in the gluten free flour, baking powder and salt. 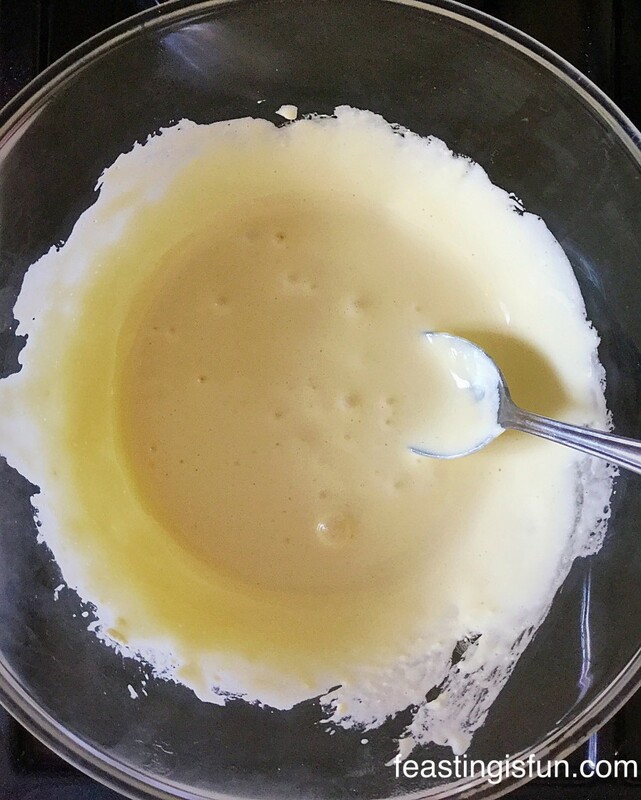 Whisk/beat until all the ingredients have come together and the batter is smooth. Always take care to not over mix the cake batter. Add the mashed mango and fold into the cake batter. Spoon the cupcake mixture evenly into the cupcake cases. 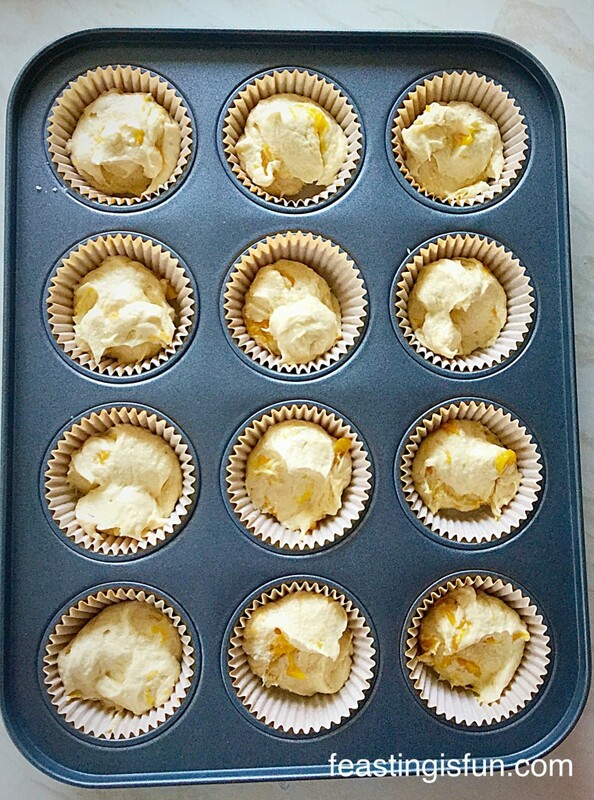 Mango Cupcakes ready for the oven. Bake in the middle of the oven for 25-30 minutes. The low slow cooking will ensure flat tops, perfect for frosting. The cupcakes are baked when they are golden brown and spring back from a light touch. Allow to cool for 5 minutes in the tin. 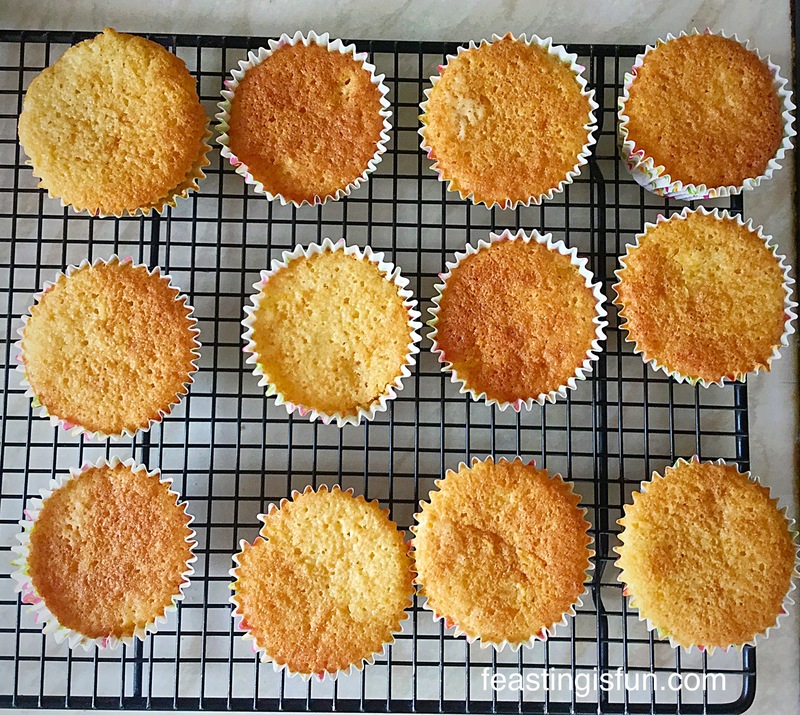 Remove the cupcakes from the tin and place on a cooling rack to cool completely. Gluten Free Cupcakes cooling on the rack. First of all, place the marshmallows into a heatproof bowl and place over a saucepan of barely simmering water. Mango and Passionfruit Marshmallows starting to melt. As the marshmallows melt it is important to keep stirring continuously. As soon as they are melted remove the bowl from the saucepan and set to one side to cool. While the melted marshmallows are cooling make the buttercream. Add the softened butter and boiling water into the bowl of sifted icing sugar. Whisk on a high speed until light and creamy. 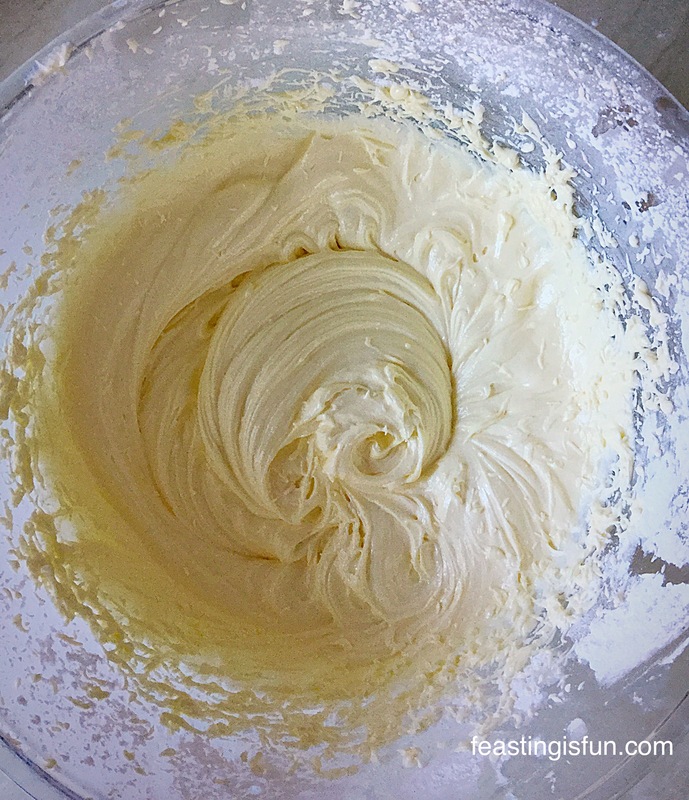 Add the glycerine and whisk into the buttercream. 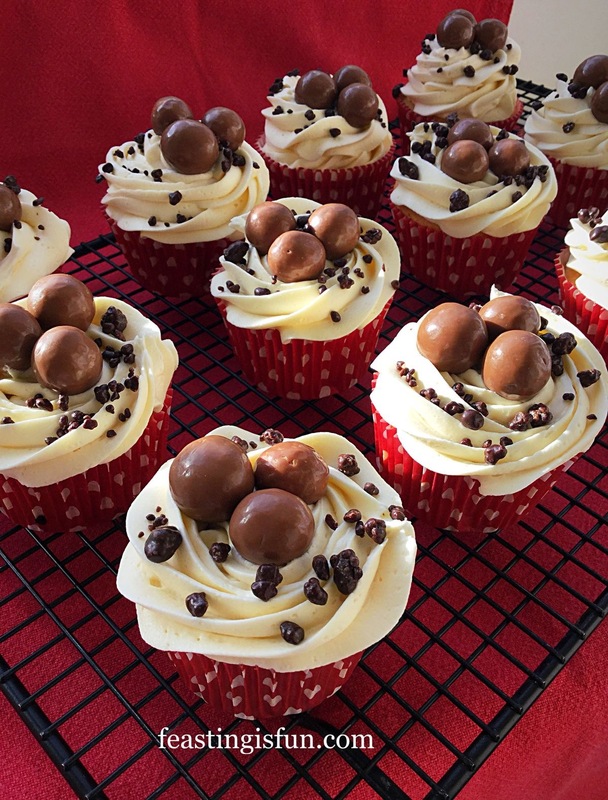 Pour the warm melted marshmallows into the buttercream, whilst the whisk is still mixing. Continue mixing on a medium speed for 5 minutes. Resulting in the lightest frosting to pipe onto your cakes. Place the bag inside a sturdy jug or glass, folding back the sides of the bag. Fill the bag with the marshmallow frosting. Pipe swirls (like ice cream in cones) or roses see here. Finally, sprinkle over the topping of your choice. 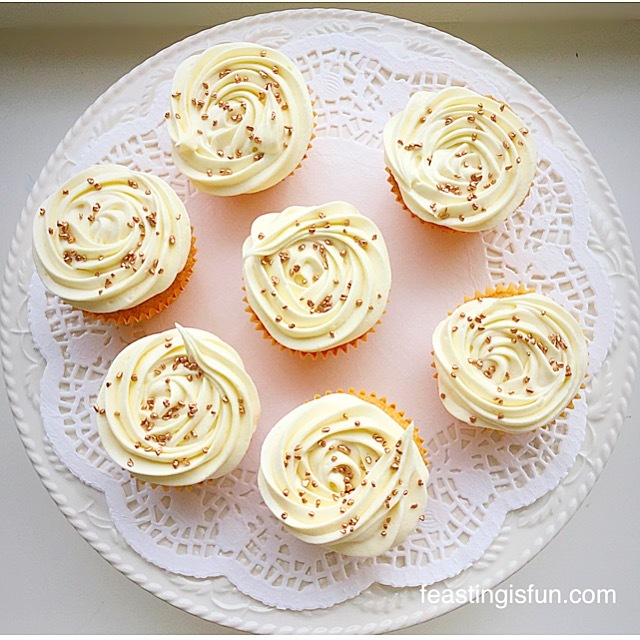 These Marshmallow Frosted Mango Cupcakes are completely delicious and in a blind taste test the gluten free cupcakes tasted exactly the same as the regular ones!! Nobody could tell the difference and happily ate both cupcakes. Also, one part that was declared “exceptional” was the marshmallow frosting. This is something that I will definitely be making again. The taste and unbelievable texture is most definitely worth the extra step! 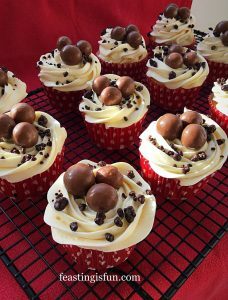 If you make these, or indeed any of my recipes, please post a photo, if you are able, on Twitter or Instagram and tag me in. 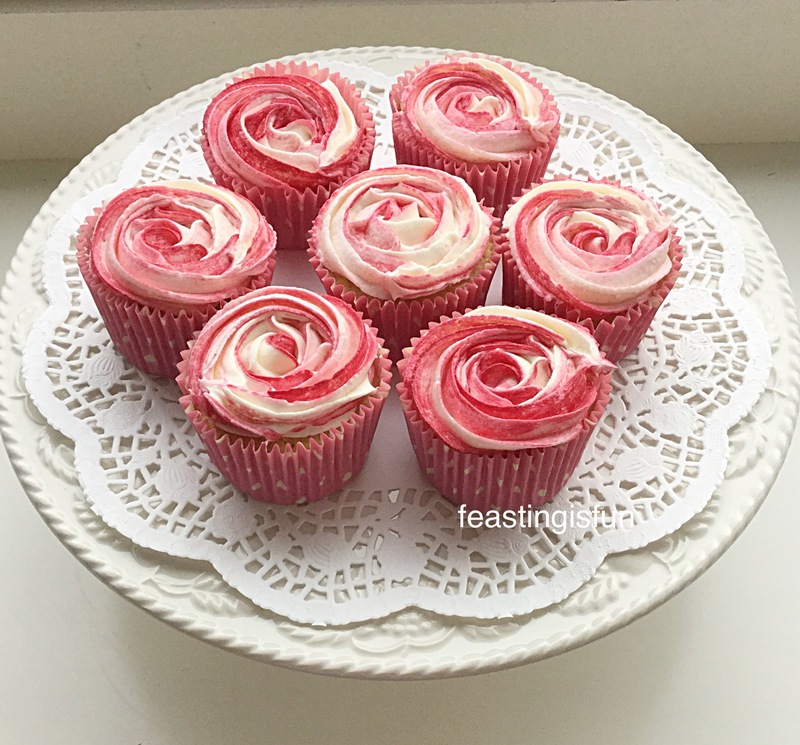 I love seeing your makes and bakes. Heavenly Marshmallows provided me with the marshmallows for this recipe. 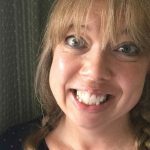 All content, photographs and recipes are my own. Please see my Disclosure Policy. I suggest Art of Mallow as a suitable replacement. These sound absolutely delicious – lovely fresh, zingy flavours. I’ve never melted marshmallows into butter icing before and will need to try that out sometime.